Casual coastal style comes to your home with this Yorkshire window planter box. It has a clean white finish, the better to show off your colorful floral arrangements. The spacious, low maintenance vinyl planter has a built-in irrigation system to keep plants healthy all season long. Watch the easy assembly!. Includes front panel, back panel, bottom panel, left end cap, right end cap, vinyl glue and 4 wall mount brackets with screws. Panels can be cut to custom lengths to fit specific window sizes. 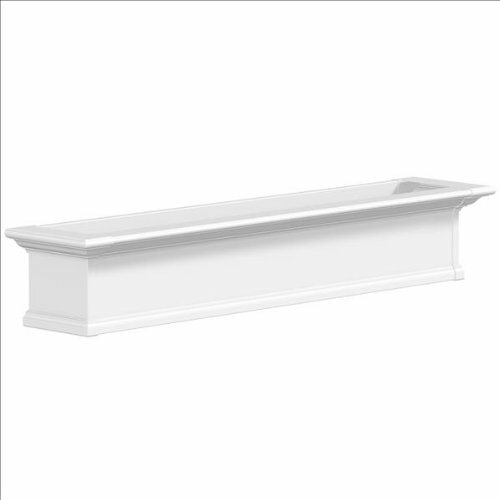 Made from high quality vinyl providing the look of a wood window box without the maintenance. Sub-irrigation water system, encourages root growth. Minimal assembly required. 15-Year limited warranty. Inner: 54 in. W x 8 in. D x 8.25 in. H (holds approx. 15 gallons of soil). 60 in. W x 12 in. D x 10 in. H (26 lbs). Please be sure to install one deck rail bracket (not included) for each wall mount bracket. These 2 brackets work together to provide stability and evenly distribute the weight of your planter, potting mix, and water. Please note that this 5 foot window box requires 4 brackets. The Yorkshire window box helps you bring home the charm of the East Coast while offering a low maintenance solution. Compliment the appearance of your home with a product that cleans up with the simple rinse of a garden hose.